It sounds extremely simple. KNOW YOUR CHILD. We homeschool our kids - by default we should really know them, right? 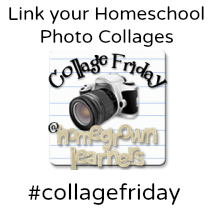 Today's Collage Friday will show you exactly how to determine your child's love language (you might already know it in which case I'm late to the party!) and show you how I made a few little adjustments in our homeschool to reflect those love languages. 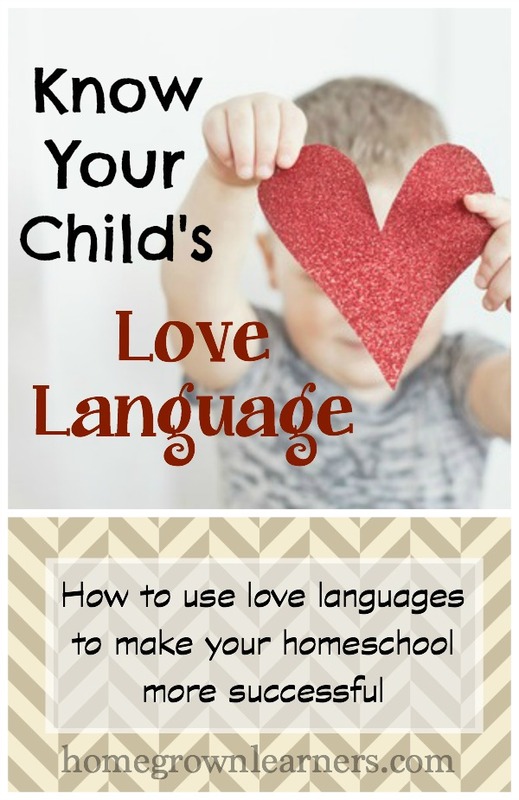 I know as moms we are constantly trying to improve our homeschools, and this is going to be a focus for me in the coming months - homeschooling according to my children's love languages! Just a note: It's been a challenging week personally in our home. My dad is in the hospital again. He is 83 and struggling with recovery from a simple surgery. He and my mom do not live near us, so I always feel helpless at these times. My father-in-law has also been admitted to the hospital this week... It's hard to concentrate on homeschool when your mind is elsewhere, and our minds are definitely not firmly on school this week. Please pray for our sweet grandpas - I know my kids are worried and while I reassure them that God has this under control I tend to worry, too. I also have other GREAT news that I'm not quite ready to share with you ( but probably will be able to in a couple weeks) that has been another focus of our week. Let's just say it's been a week of UPS and DOWNS and one where my husband and I feel firmly planted in middle age. Can anyone relate? I printed out this simple Love Languages Profile Test. My kids got a kick out of taking it and then seeing what their love languages were. After I found out the results it made SO MUCH SENSE to me, but then I wondered why on earth I don't capitalize on this knowledge? Grant's love language was no surprise to me - it was Words of Affirmation. This child would rather hear praise from you than have you bring him home a surprise. He would rather shoot baskets with you while you're telling him what a great job he is doing instead of going to get ice cream with you. A high five goes a LONG way with this kid. So - what does that look like in our homeschool? One of the most simple things I did was bring out the STICKERS. I started putting stickers on everything this week (he is particularly nuts about the Peanuts stickers!) and he was happy as a clam. I also tried to heap on lots of words of encouragement and praise - not empty praise, mind you - but genuine words of affirmation that would let Grant know I recognize the good things he does and all of the attempts he makes during a day to please all of us. He also really appreciates his chore system - so simple and effective. Checking off boxes certainly must be a love language, too! I have such a sweet boy. I was surprised about the results for my teenager. Her quiz overwhelmingly showed her love language is quality time. You would think that homeschooling affords us A LOT of this, but I disagree. I think homeschooling gives us a false sense of spending quality time with our children. 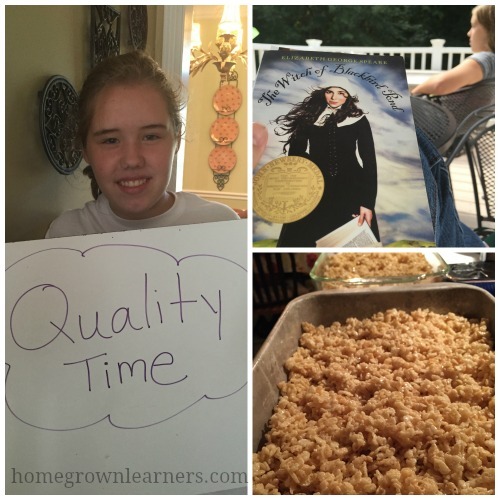 What about quality time in our homeschool day? As we sought a "school" environment for Anna, it was important to us that the class be small and just one day a week, which is one of the reasons we chose the Classical Conversations Challenge program. She thrives on personal relationships and just a few (but very close) friendships. Our school choice perfectly fits her love language! I've tried to make read aloud time sacred. This time really speaks to Anna. She loves relaxing on the deck while I read out loud. It is the most peaceful time of our day. Having one on one time with her dad (he teaches science) also means a lot to Anna. Knowing that he takes time at night after a long day of work makes an impression on her. She also loves to be in the kitchen with me. Simply helping me with Rice Krispie treats or just talking to me while I cook is quality time. I'm looking forward to finishing The Five Love Languages of Teenagers to learn more. When my kids were little I felt so confident about my parent abilities, but the teenager years are a completely different ballgame. I'm sure God is refining me during these years. We finally made it to the library this week. I have been missing long trips to the library, and I just carved out time on Wednesday and it was SO WORTH IT. Anna LOVES to read, but Grant only reads a selective few things - usually reading for information, not chapter books. I'm hoping to broaden his horizons this year by providing interesting reading material for him. While Anna was in a study group at the library, Grant found an entire table devoted to football (God bless the library who did that!). He sat down and read a bit and then decided to knock out a math assignment. He felt quite studious at the library. I also went to the children's section and picked out a few Matt Christopher books (great for those sport lovers) and found a great Scholastic biography, Linnspired. Grant will read if I ask him to, but I have never gotten the impression he LOVES it. Who knows? Maybe he just won't be someone who loves reading. I'm ok with that, but I have to try. I'm hoping to make library trips happen every couple of weeks from now on. After next Tuesday's Classical Conversations day we will be on a one week break.